title ArmA 3 Server Monitor! echo ArmA 3 Server Monitor... Active ! echo ArmA 3 Server Shutdown ... Restarting!  1:53:59 SteamAPI initialization failed. Steam features won't be accessible! 1:54:14 Cannot delete class B_KickOff, it is referenced somewhere (used as a base class probably). 1:54:15 PhysX3 SDK Init ended. 1:54:17 Warning Message: You cannot play/edit this mission; it is dependent on downloadable content that has been deleted. 1:54:35 "Epoch: Advanced Vehicle Repair Enabled"
1:54:35 "Epoch: Starting ArmA3 Epoch Server, Version 1.2.0. Note: If server crashes directly after this point check that Redis is running and the connection info is correct." 1:54:35 c:\bis\source\stable\futura\lib\network\networkserver.cpp NetworkServer::OnClientStateChanged:NOT IMPLEMENTED - briefing! 1:54:35 "Epoch: Set Real Time: [2018,08,05,01,54,35]"
1:54:35 "Epoch: Start Hive, Instance ID: 'NA123'"
1:54:35 "Epoch: Init Connect/Disconnect handlers"
1:54:35 "Epoch: Setup Side Settings"
1:54:35 "Epoch: Setup World Settings for Altis"
1:54:36 "Epoch: Loading teleports and static props"
1:54:36 "Epoch: Loading NPC traders"
1:54:37 "Epoch: Spawning NPC traders"
1:54:43 "DEBUG: vehicle destroyed already (0) or invalid vehicle class: "
1:54:43 "Epoch: Vehicle SPAWN TIMER 0.185001, LOADED 0 VEHICLES"
1:54:43 "DEBUG: LootTable: EPOCH_LT_CfgMainTable_Vehicle_tables DATA: [""Items"",0.06,""Equipment"",0.06,""Pistols"",0.06,""PistolAmmo"",0.06,""Scopes"",0.04,""Muzzles"",0.04,""Uniforms"",0.06,""Vests"",0.06,""Headgear"",0.06,""Food"",0.04,""Generic"",0.06,""GenericAuto"",0.06,""Machinegun"",0.04,""MachinegunAmmo"",0.04,""Rifle"",0.05,""RifleAmmo"",0.04,""SniperRifle"",0.03,""SniperRifleAmmo"",0.04,""Hand"",0.04,""Grenades"",0.02,""Backpack"",0.04]"
1:54:43 "DEBUG: LootTable: EPOCH_LT_CfgLootTable_PistolAmmo_items DATA: [[""EnergyPack"",""magazine""],0.04,[""6Rnd_RedSignal_F"",""magazine""],0.02,[""6Rnd_GreenSignal_F"",""magazine""],0.02,[""30Rnd_9x21_Mag"",""magazine""],0.1,[""6Rnd_45ACP_Cylinder"",""magazine""],0.11,[""16Rnd_9x21_Mag"",""magazine""],0.11,[""11Rnd_45ACP_Mag"",""magazine""],0.12,[""9Rnd_45ACP_Mag"",""magazine""],0.16,[""9rnd_45X88_magazine"",""magazine""],0.16,[""10rnd_22X44_magazine"",""magazine""],0.16]"
1:54:43 "DEBUG: LootTable: EPOCH_LT_CfgLootTable_Uniforms_items DATA: [[""MaleUniforms"",""CfgLootTable""],0.5,[""FemaleUniforms"",""CfgLootTable""],0.5]"
1:54:43 "DEBUG: LootTable: EPOCH_LT_CfgLootTable_RifleAmmo_items DATA: [[""30Rnd_762x39_Mag"",""magazine""],0.08,[""RifleAmmo_30Rnd_65x39_caseless_mag"",""CfgLootTable""],0.14,[""20Rnd_556x45_UW_mag"",""magazine""],0.12,[""RifleAmmo_30Rnd_556x45_Stanag"",""CfgLootTable""],0.13,[""RifleAmmo_30Rnd_45ACP_Mag_SMG_01"",""CfgLootTable""],0.16,[""30Rnd_9x21_Mag"",""magazine""],0.17,[""5Rnd_rollins_mag"",""magazine""],0.2]"
1:54:43 "DEBUG: LootTable: EPOCH_LT_CfgLootTable_RifleAmmo_30Rnd_45ACP_Mag_SMG_01_items DATA: [[""30Rnd_45ACP_Mag_SMG_01"",""magazine""],0.666667,[""30Rnd_45ACP_Mag_SMG_01_Tracer_Green"",""magazine""],0.333333]"
1:54:43 "DEBUG: LootTable: EPOCH_LT_CfgLootTable_GenericAuto_items DATA: [[""VehicleDocs"",""CfgLootTable""],0.0366972,[""ItemSafe"",""magazine""],0.00917431,[""ItemLockbox"",""magazine""],0.0366972,[""jerrycan_epoch"",""magazine""],0.0458716,[""CircuitParts"",""magazine""],0.0550459,[""MortarBucket"",""magazine""],0.0825688,[""Repairs"",""CfgLootTable""],0.0917431,[""ItemCorrugated"",""magazine""],0.100917,[""ItemBulb"",""magazine""],0.0183486,[""CinderBlocks"",""magazine""],0.110092,[""JackKit"",""magazine""],0.0733945,[""ItemCoolerE"",""magazine""],0.119266,[""ItemScraps"",""magazine""],0.119266,[""lighter_epoch"",""magazine""],0.00917431,[""ItemSolar"",""magazine""],0.0275229,[""ItemBattery"",""magazine""],0.0275229,[""ItemCables"",""magazine""],0.0275229,[""ItemBarrelE"",""magazine""],0.00917431]"
1:54:43 "DEBUG: LootTable: EPOCH_LT_CfgLootTable_Hand_items DATA: [[""SmokeShell"",""magazine""],0.0833333,[""SmokeShellYellow"",""magazine""],0.0833333,[""SmokeShellGreen"",""magazine""],0.0833333,[""SmokeShellToxic"",""magazine""],0.0833333,[""SmokeShellRed"",""magazine""],0.0833333,[""SmokeShellPurple"",""magazine""],0.0833333,[""SmokeShellOrange"",""magazine""],0.0833333,[""SmokeShellBlue"",""magazine""],0.0833333,[""Chemlight_green"",""magazine""],0.0833333,[""Chemlight_red"",""magazine""],0.0833333,[""Chemlight_yellow"",""magazine""],0.0833333,[""Chemlight_blue"",""magazine""],0.0833333]"
1:54:43 "DEBUG: LootTable: EPOCH_LT_CfgLootTable_Scopes_items DATA: [[""optic_NVS"",""item""],0.01,[""optic_tws"",""item""],0.01,[""optic_tws_mg"",""item""],0.01,[""optic_SOS"",""item""],0.02,[""optic_LRPS"",""item""],0.02,[""ScopeAMSMarkDLC"",""CfgLootTable""],0.02,[""ScopeKHSMarkDLC"",""CfgLootTable""],0.02,[""optic_DMS"",""item""],0.03,[""optic_Arco"",""item""],0.04,[""optic_Hamr"",""item""],0.05,[""Elcan_epoch"",""item""],0.05,[""Elcan_reflex_epoch"",""item""],0.05,[""optic_MRCO"",""item""],0.06,[""optic_Holosight"",""item""],0.06,[""optic_Holosight_smg"",""item""],0.06,[""optic_Aco"",""item""],0.07,[""optic_ACO_grn"",""item""],0.07,[""optic_Aco_smg"",""item""],0.07,[""optic_ACO_grn_smg"",""item""],0.08,[""optic_Yorris"",""item""],0.1,[""optic_MRD"",""item""],0.1]"
1:54:43 "DEBUG: LootTable: EPOCH_LT_CfgLootTable_ScopeKHSMarkDLC_items DATA: [[""optic_KHS_blk"",""item""],0.2,[""optic_KHS_hex"",""item""],0.2,[""optic_KHS_old"",""item""],0.4,[""optic_KHS_tan"",""item""],0.2]"
1:54:43 "DEBUG: LootTable: EPOCH_LT_CfgLootTable_SniperRifle_items DATA: [[""SniperRiflem107"",""CfgLootTable""],0.08,[""SniperRifleMarkDLC"",""CfgLootTable""],0.1,[""srifle_LRR_F"",""weapon""],0.11,[""srifle_GM6_F"",""weapon""],0.16,[""srifle_DMR_01_F"",""weapon""],0.17,[""SniperRifleM14"",""CfgLootTable""],0.18,[""srifle_EBR_F"",""weapon""],0.2]"
1:54:44 "DEBUG: LootTable: EPOCH_LT_CfgLootTable_Equipment_items DATA: [[""Rangefinder"",""weapon""],0.157895,[""Binocular"",""item""],0.421053,[""NVG_EPOCH"",""item""],0.0526316,[""acc_flashlight"",""item""],0.157895,[""acc_flashlight_pistol"",""item""],0.105263,[""acc_pointer_IR"",""item""],0.0526316,[""Bipods"",""CfgLootTable""],0.0526316]"
1:54:44 "DEBUG: LootTable: EPOCH_LT_CfgLootTable_Machinegun_items DATA: [[""LMG_Zafir_F"",""weapon""],0.1,[""Machinegun_arifle_MX_SW_F"",""CfgLootTable""],0.2,[""LMG_Mk200_F"",""weapon""],0.3,[""Machinegun_m249_EPOCH"",""CfgLootTable""],0.3,[""MMG_MarkDLC_EPOCH"",""CfgLootTable""],0.1]"
1:54:44 "DEBUG: LootTable: EPOCH_LT_CfgLootTable_Machinegun_m249_EPOCH_items DATA: [[""m249_EPOCH"",""weapon""],0.5,[""m249Tan_EPOCH"",""weapon""],0.5]"
1:54:44 "DEBUG: LootTable: EPOCH_LT_CfgLootTable_Grenades_items DATA: [[""SmokeGrenades3Rnd"",""CfgLootTable""],0.2,[""Flares"",""CfgLootTable""],0.3,[""SmokeGrenades1Rnd"",""CfgLootTable""],0.5]"
1:54:44 "DEBUG: LootTable: EPOCH_LT_CfgLootTable_SmokeGrenades1Rnd_items DATA: [[""1Rnd_Smoke_Grenade_shell"",""magazine""],0.142857,[""1Rnd_SmokeRed_Grenade_shell"",""magazine""],0.142857,[""1Rnd_SmokeGreen_Grenade_shell"",""magazine""],0.142857,[""1Rnd_SmokeYellow_Grenade_shell"",""magazine""],0.142857,[""1Rnd_SmokePurple_Grenade_shell"",""magazine""],0.142857,[""1Rnd_SmokeBlue_Grenade_shell"",""magazine""],0.142857,[""1Rnd_SmokeOrange_Grenade_shell"",""magazine""],0.142857]"
1:54:44 "DEBUG: LootTable: EPOCH_LT_CfgLootTable_Flares_items DATA: [[""3Rnd_UGL_FlareWhite_F"",""magazine""],0.1,[""3Rnd_UGL_FlareGreen_F"",""magazine""],0.1,[""3Rnd_UGL_FlareRed_F"",""magazine""],0.1,[""3Rnd_UGL_FlareYellow_F"",""magazine""],0.1,[""3Rnd_UGL_FlareCIR_F"",""magazine""],0.1,[""UGL_FlareWhite_F"",""magazine""],0.1,[""UGL_FlareGreen_F"",""magazine""],0.1,[""UGL_FlareRed_F"",""magazine""],0.1,[""UGL_FlareYellow_F"",""magazine""],0.1,[""UGL_FlareCIR_F"",""magazine""],0.1]"
1:54:44 "DEBUG: LootTable: EPOCH_LT_CfgLootTable_Repairs_items DATA: [[""VehicleRepair"",""magazine""],0.288462,[""SpareTire"",""magazine""],0.0961538,[""EngineParts"",""magazine""],0.0961538,[""EngineBlock"",""magazine""],0.0961538,[""ItemGlass"",""magazine""],0.144231,[""ItemDuctTape"",""magazine""],0.192308,[""FuelTank"",""magazine""],0.0384615,[""ItemRotor"",""magazine""],0.0480769]"
1:54:44 "DEBUG: LootTable: EPOCH_LT_CfgLootTable_RifleAmmo_30Rnd_65x39_caseless_mag_items DATA: [[""30Rnd_65x39_caseless_mag"",""magazine""],0.3,[""30Rnd_65x39_caseless_mag_Tracer"",""magazine""],0.2,[""30Rnd_65x39_caseless_green"",""magazine""],0.3,[""30Rnd_65x39_caseless_green_mag_Tracer"",""magazine""],0.2]"
1:54:44 "DEBUG: LootTable: EPOCH_LT_CfgLootTable_Generic_items DATA: [[""ItemDocument"",""magazine""],0.0420168,[""ItemMixOil"",""magazine""],0.0336134,[""ItemCoolerE"",""magazine""],0.0504202,[""CircuitParts"",""magazine""],0.0672269,[""Repairs"",""CfgLootTable""],0.0588235,[""Towelette"",""magazine""],0.117647,[""HotColdPacks"",""CfgLootTable""],0.0756303,[""PaintCans"",""CfgLootTable""],0.0756303,[""Sodas"",""CfgLootTable""],0.0672269,[""CanFood"",""CfgLootTable""],0.0672269,[""Primitive"",""CfgLootTable""],0.176471,[""lighter_epoch"",""magazine""],0.00840336,[""Seeds"",""CfgLootTable""],0.00840336,[""ItemAluminumBar"",""magazine""],0.0168067,[""ItemCopperBar"",""magazine""],0.0168067,[""ItemTinBar"",""magazine""],0.00840336,[""ItemCanteen_Dirty"",""magazine""],0.0420168,[""ItemCanteen_Clean"",""magazine""],0.00840336,[""ItemBottlePlastic_Dirty"",""magazine""],0.0420168,[""ItemBottlePlastic_Clean"",""magazine""],0.00840336,[""ItemFireExtinguisher"",""magazine""],0.00840336]"
1:54:44 "DEBUG: LootTable: EPOCH_LT_CfgLootTable_Sodas_items DATA: [[""WhiskeyNoodle"",""magazine""],0.049505,[""ItemSodaOrangeSherbet"",""magazine""],0.128713,[""ItemSodaAlpineDude"",""magazine""],0.0594059,[""ItemSodaPurple"",""magazine""],0.128713,[""ItemSodaMocha"",""magazine""],0.118812,[""ItemSodaBurst"",""magazine""],0.148515,[""ItemSodaRbull"",""magazine""],0.128713,[""FoodWalkNSons"",""magazine""],0.128713,[""ItemSodaEmpty"",""magazine""],0.108911]"
1:54:44 "DEBUG: LootTable: EPOCH_LT_CfgLootTable_Food_items DATA: [[""ItemCoolerE"",""magazine""],0.0291262,[""bluburger_epoch"",""magazine""],0.038835,[""redburger_epoch"",""magazine""],0.038835,[""gyro_wrap_epoch"",""magazine""],0.038835,[""icecream_epoch"",""magazine""],0.0291262,[""Sodas"",""CfgLootTable""],0.436893,[""CanFood"",""CfgLootTable""],0.38835]"
1:54:44 "DEBUG: LootTable: EPOCH_LT_CfgLootTable_CanFood_items DATA: [[""ItemPowderMilk"",""magazine""],0.0247934,[""ItemRicebox"",""magazine""],0.0247934,[""ItemCereals"",""magazine""],0.0247934,[""ItemVitamins"",""magazine""],0.0247934,[""honey_epoch"",""magazine""],0.0413223,[""emptyjar_epoch"",""magazine""],0.107438,[""water_epoch"",""magazine""],0.0247934,[""clean_water_epoch"",""magazine""],0.00826446,[""FoodBioMeat"",""magazine""],0.0909091,[""sardines_epoch"",""magazine""],0.0909091,[""meatballs_epoch"",""magazine""],0.107438,[""scam_epoch"",""magazine""],0.115702,[""sweetcorn_epoch"",""magazine""],0.115702,[""FoodSnooter"",""magazine""],0.0413223,[""krypto_candy_epoch"",""magazine""],0.0330578,[""TacticalBacon"",""magazine""],0.0413223,[""FoodMeeps"",""magazine""],0.00826446,[""ItemEmptyTin"",""magazine""],0.0413223,[""ItemBakedBeans"",""magazine""],0.0247934,[""HotAxeSauce_epoch"",""magazine""],0.00826446]"
1:54:44 "DEBUG: LootTable: EPOCH_LT_CfgLootTable_Muzzles_items DATA: [[""muzzle_sr25S_epoch"",""item""],0.1,[""muzzle_snds_H"",""item""],0.1,[""muzzle_snds_M"",""item""],0.1,[""muzzle_snds_L"",""item""],0.1,[""muzzle_snds_B"",""item""],0.1,[""muzzle_snds_H_MG"",""item""],0.1,[""muzzle_snds_acp"",""item""],0.1,[""Muzzles_MultiGun"",""CfgLootTable""],0.1,[""Muzzles_338MarkDLC"",""CfgLootTable""],0.1,[""Muzzles_93mmgMarkDLC"",""CfgLootTable""],0.1]"
1:54:44 "DEBUG: LootTable: EPOCH_LT_CfgLootTable_Muzzles_93mmgMarkDLC_items DATA: [[""muzzle_snds_93mmg"",""item""],0.5,[""muzzle_snds_93mmg_tan"",""item""],0.5]"
1:54:45 "DEBUG: LootTable: EPOCH_LT_CfgLootTable_SniperRifleAmmo_items DATA: [[""20Rnd_762x51_Mag"",""magazine""],0.142857,[""SniperRifleAmmo_5Rnd_127x108_Mag"",""CfgLootTable""],0.142857,[""7Rnd_408_Mag"",""magazine""],0.142857,[""10Rnd_762x54_Mag"",""magazine""],0.142857,[""10Rnd_338_Mag"",""magazine""],0.142857,[""10Rnd_93x64_DMR_05_Mag"",""magazine""],0.142857,[""10Rnd_127x54_Mag"",""magazine""],0.142857]"
1:54:45 "DEBUG: LootTable: EPOCH_LT_CfgLootTable_Rifle_items DATA: [[""AKM_EPOCH"",""weapon""],0.03,[""sr25_epoch"",""weapon""],0.04,[""Rifle_arifle_Katiba_F"",""CfgLootTable""],0.05,[""Rifle_arifle_MX_GL_F"",""CfgLootTable""],0.06,[""Rifle_l85a2_epoch"",""CfgLootTable""],0.06,[""m4a3_EPOCH"",""weapon""],0.07,[""Rifle_m16_EPOCH"",""CfgLootTable""],0.07,[""Rifle_arifle_Mk20_F"",""CfgLootTable""],0.08,[""Rifle_arifle_TRG21_F"",""CfgLootTable""],0.08,[""arifle_SDAR_F"",""weapon""],0.09,[""Rollins_F"",""weapon""],0.09,[""SMG_01_F"",""weapon""],0.09,[""SMG_02_F"",""weapon""],0.09,[""hgun_PDW2000_F"",""weapon""],0.1]"
1:54:45 "DEBUG: LootTable: EPOCH_LT_CfgLootTable_Rifle_l85a2_epoch_items DATA: [[""l85a2_epoch"",""weapon""],0.333333,[""l85a2_pink_epoch"",""weapon""],0.333333,[""l85a2_ugl_epoch"",""weapon""],0.333333]"
1:54:45 "DEBUG: LootTable: EPOCH_LT_CfgLootTable_Machinegun_arifle_MX_SW_F_items DATA: [[""arifle_MX_SW_F"",""weapon""],0.666667,[""arifle_MX_SW_Black_F"",""weapon""],0.333333]"
1:54:45 "DEBUG: LootTable: EPOCH_LT_CfgLootTable_Pistols_items DATA: [[""Hgun_Pistol_Signal_F"",""weapon""],0.04,[""MultiGun"",""weapon""],0.05,[""hgun_Pistol_heavy_01_F"",""weapon""],0.09,[""hgun_P07_F"",""weapon""],0.1,[""hgun_Rook40_F"",""weapon""],0.11,[""hgun_Pistol_heavy_02_F"",""weapon""],0.13,[""1911_pistol_epoch"",""weapon""],0.14,[""hgun_ACPC2_F"",""weapon""],0.16,[""ruger_pistol_epoch"",""weapon""],0.18]"
1:54:46 "DEBUG: LootTable: EPOCH_LT_CfgLootTable_Headgear_items DATA: [[""HeadgearArmored"",""CfgLootTable""],0.1,[""HeadgearNoArmor"",""CfgLootTable""],0.9]"
1:54:46 "DEBUG: LootTable: EPOCH_LT_CfgLootTable_Items_items DATA: [[""ItemCompass"",""item""],0.2,[""ItemGeigerCounter_EPOCH"",""item""],0.01,[""ItemGPS"",""item""],0.09,[""EpochRadio0"",""item""],0.03,[""EpochRadio1"",""item""],0.03,[""EpochRadio2"",""item""],0.03,[""EpochRadio3"",""item""],0.02,[""EpochRadio4"",""item""],0.02,[""EpochRadio5"",""item""],0.02,[""EpochRadio6"",""item""],0.02,[""EpochRadio7"",""item""],0.01,[""EpochRadio8"",""item""],0.01,[""EpochRadio9"",""item""],0.01,[""ItemWatch"",""item""],0.3,[""FAK"",""magazine""],0.2]"
1:54:46 "DEBUG: LootTable: EPOCH_LT_CfgLootTable_Rifle_arifle_Mk20_F_items DATA: [[""arifle_Mk20_GL_F"",""weapon""],0.12,[""arifle_Mk20_GL_plain_F"",""weapon""],0.12,[""arifle_Mk20C_F"",""weapon""],0.16,[""arifle_Mk20C_plain_F"",""weapon""],0.18,[""arifle_Mk20_F"",""weapon""],0.2,[""arifle_Mk20_plain_F"",""weapon""],0.22]"
1:54:46 "DEBUG: LootTable: EPOCH_LT_CfgMainTable_VehicleBoat_tables DATA: [""Items"",0.06,""Equipment"",0.06,""Pistols"",0.05,""PistolAmmo"",0.07,""Scopes"",0.05,""Muzzles"",0.05,""Uniforms"",0.06,""Vests"",0.05,""Headgear"",0.05,""Food"",0.07,""Generic"",0.08,""GenericAuto"",0.09,""RifleBoat"",0.05,""RifleAmmoBoat"",0.09,""Hand"",0.05,""Grenades"",0.02,""Backpack"",0.05]"
1:54:46 "DEBUG: LootTable: EPOCH_LT_CfgLootTable_RifleBoat_items DATA: [[""Rollins_F"",""weapon""],0.102041,[""SMG_02_F"",""weapon""],0.122449,[""SMG_01_F"",""weapon""],0.163265,[""hgun_PDW2000_F"",""weapon""],0.183673,[""arifle_SDAR_F"",""weapon""],0.204082,[""speargun_epoch"",""weapon""],0.22449]"
1:54:46 "DEBUG: LootTable: EPOCH_LT_CfgLootTable_SniperRifleM14_items DATA: [[""M14_EPOCH"",""weapon""],0.5,[""M14Grn_EPOCH"",""weapon""],0.5]"
1:54:47 "DEBUG: LootTable: EPOCH_LT_CfgLootTable_VehicleDocs_items DATA: [[""ItemVehDoc1"",""magazine""],0.487805,[""ItemVehDoc2"",""magazine""],0.365854,[""ItemVehDoc3"",""magazine""],0.097561,[""ItemVehDoc4"",""magazine""],0.0487805]"
1:54:47 "DEBUG: LootTable: EPOCH_LT_CfgLootTable_Muzzles_MultiGun_items DATA: [[""Heal_EPOCH"",""item""],0.333333,[""Defib_EPOCH"",""item""],0.333333,[""Repair_EPOCH"",""item""],0.333333]"
1:54:47 "DEBUG: LootTable: EPOCH_LT_CfgLootTable_HotColdPacks_items DATA: [[""HeatPack"",""magazine""],0.5,[""ColdPack"",""magazine""],0.5]"
1:54:47 "DEBUG: LootTable: EPOCH_LT_CfgLootTable_RifleAmmoBoat_items DATA: [[""30Rnd_9x21_Mag"",""magazine""],0.1,[""16Rnd_9x21_Mag"",""magazine""],0.15,[""spear_magazine"",""magazine""],0.2,[""20Rnd_556x45_UW_mag"",""magazine""],0.25,[""5Rnd_rollins_mag"",""magazine""],0.3]"
1:54:47 "DEBUG: LootTable: EPOCH_LT_CfgLootTable_Backpack_items DATA: [[""B_AssaultPack_cbr"",""backpack""],0.0454545,[""B_AssaultPack_dgtl"",""backpack""],0.0454545,[""B_AssaultPack_khk"",""backpack""],0.0454545,[""B_AssaultPack_mcamo"",""backpack""],0.0454545,[""B_AssaultPack_ocamo"",""backpack""],0.0454545,[""B_AssaultPack_rgr"",""backpack""],0.0454545,[""B_AssaultPack_sgg"",""backpack""],0.0454545,[""B_AssaultPack_blk"",""backpack""],0.0454545,[""B_AssaultPack_tna_F"",""backpack""],0.0454545,[""B_Carryall_cbr"",""backpack""],0.00909091,[""B_Carryall_khk"",""backpack""],0.00909091,[""B_Carryall_mcamo"",""backpack""],0.00909091,[""B_Carryall_ocamo"",""backpack""],0.00909091,[""B_Carryall_oli"",""backpack""],0.00909091,[""B_Carryall_oucamo"",""backpack""],0.00909091,[""B_FieldPack_blk"",""backpack""],0.0363636,[""B_FieldPack_cbr"",""backpack""],0.0363636,[""B_FieldPack_khk"",""backpack""],0.0363636,[""B_FieldPack_ocamo"",""backpack""],0.0363636,[""B_FieldPack_oli"",""backpack""],0.0363636,[""B_FieldPack_oucamo"",""
1:54:47 "DEBUG: LootTable: EPOCH_LT_CfgLootTable_Primitive_items DATA: [[""ItemRock"",""magazine""],0.333333,[""ItemRope"",""magazine""],0.133333,[""ItemStick"",""magazine""],0.333333,[""ItemScraps"",""magazine""],0.0666667,[""ItemCanvas"",""magazine""],0.0666667,[""ItemBurlap"",""magazine""],0.0666667]"
1:54:47 "DEBUG: LootTable: EPOCH_LT_CfgLootTable_Rifle_arifle_TRG21_F_items DATA: [[""arifle_TRG21_GL_F"",""weapon""],0.2,[""arifle_TRG21_F"",""weapon""],0.3,[""arifle_TRG20_F"",""weapon""],0.5]"
1:54:47 "DEBUG: LootTable: EPOCH_LT_CfgLootTable_MachinegunAmmo_items DATA: [[""MachinegunAmmo_200Rnd_65x39_cased_Box"",""CfgLootTable""],0.0769231,[""130Rnd_338_Mag"",""magazine""],0.0576923,[""MachinegunAmmo_150Rnd_762x54_Box"",""CfgLootTable""],0.0961538,[""MachinegunAmmo_100Rnd_65x39_caseless_mag"",""CfgLootTable""],0.211538,[""200Rnd_556x45_M249"",""magazine""],0.182692,[""150Rnd_93x64_Mag"",""magazine""],0.0961538,[""MachinegunAmmo_30Rnd_65x39_caseless_mag"",""CfgLootTable""],0.278846]"
1:54:47 "DEBUG: LootTable: EPOCH_LT_CfgLootTable_MachinegunAmmo_30Rnd_65x39_caseless_mag_items DATA: [[""30Rnd_65x39_caseless_mag"",""magazine""],0.666667,[""30Rnd_65x39_caseless_mag_Tracer"",""magazine""],0.333333]"
1:54:48 "DEBUG: LootTable: EPOCH_LT_CfgLootTable_SmokeGrenades3Rnd_items DATA: [[""3Rnd_Smoke_Grenade_shell"",""magazine""],0.142857,[""3Rnd_SmokeRed_Grenade_shell"",""magazine""],0.142857,[""3Rnd_SmokeGreen_Grenade_shell"",""magazine""],0.142857,[""3Rnd_SmokeYellow_Grenade_shell"",""magazine""],0.142857,[""3Rnd_SmokePurple_Grenade_shell"",""magazine""],0.142857,[""3Rnd_SmokeBlue_Grenade_shell"",""magazine""],0.142857,[""3Rnd_SmokeOrange_Grenade_shell"",""magazine""],0.142857]"
1:54:49 "DEBUG: LootTable: EPOCH_LT_CfgLootTable_Rifle_arifle_MX_GL_F_items DATA: [[""arifle_MX_GL_F"",""weapon""],0.142857,[""arifle_MX_GL_Black_F"",""weapon""],0.0952381,[""arifle_MXM_Black_F"",""weapon""],0.0952381,[""arifle_MXC_Black_F"",""weapon""],0.142857,[""arifle_MX_Black_F"",""weapon""],0.0952381,[""arifle_MXM_F"",""weapon""],0.142857,[""arifle_MXC_F"",""weapon""],0.142857,[""arifle_MX_F"",""weapon""],0.142857]"
1:54:49 "DEBUG: LootTable: EPOCH_LT_CfgLootTable_MachinegunAmmo_100Rnd_65x39_caseless_mag_items DATA: [[""100Rnd_65x39_caseless_mag"",""magazine""],0.666667,[""100Rnd_65x39_caseless_mag_Tracer"",""magazine""],0.333333]"
1:54:50 "DEBUG: LootTable: EPOCH_LT_CfgLootTable_Bipods_items DATA: [[""bipod_01_F_snd"",""item""],0.125,[""bipod_01_F_blk"",""item""],0.125,[""bipod_01_F_mtp"",""item""],0.125,[""bipod_02_F_blk"",""item""],0.125,[""bipod_02_F_tan"",""item""],0.125,[""bipod_02_F_hex"",""item""],0.125,[""bipod_03_F_blk"",""item""],0.125,[""bipod_03_F_oli"",""item""],0.125]"
1:54:50 "DEBUG: LootTable: EPOCH_LT_CfgLootTable_Muzzles_338MarkDLC_items DATA: [[""muzzle_snds_338_black"",""item""],0.333333,[""muzzle_snds_338_green"",""item""],0.333333,[""muzzle_snds_338_sand"",""item""],0.333333]"
1:54:50 "DEBUG: LootTable: EPOCH_LT_CfgLootTable_MachinegunAmmo_200Rnd_65x39_cased_Box_items DATA: [[""200Rnd_65x39_cased_Box"",""magazine""],0.666667,[""200Rnd_65x39_cased_Box_Tracer"",""magazine""],0.333333]"
1:54:51 "DEBUG: LootTable: EPOCH_LT_CfgLootTable_RifleAmmo_30Rnd_556x45_Stanag_items DATA: [[""30Rnd_556x45_Stanag"",""magazine""],0.4,[""30Rnd_556x45_Stanag_Tracer_Red"",""magazine""],0.2,[""30Rnd_556x45_Stanag_Tracer_Green"",""magazine""],0.2,[""30Rnd_556x45_Stanag_Tracer_Yellow"",""magazine""],0.2]"
1:54:53 "DEBUG: LootTable: EPOCH_LT_CfgLootTable_SniperRiflem107_items DATA: [[""m107_EPOCH"",""weapon""],0.5,[""m107Tan_EPOCH"",""weapon""],0.5]"
1:54:53 "DEBUG: LootTable: EPOCH_LT_CfgLootTable_PaintCans_items DATA: [[""PaintCanClear"",""magazine""],0.1,[""PaintCanBlk"",""magazine""],0.1,[""PaintCanBlu"",""magazine""],0.1,[""PaintCanBrn"",""magazine""],0.1,[""PaintCanGrn"",""magazine""],0.1,[""PaintCanOra"",""magazine""],0.1,[""PaintCanPur"",""magazine""],0.1,[""PaintCanRed"",""magazine""],0.1,[""PaintCanTeal"",""magazine""],0.1,[""PaintCanYel"",""magazine""],0.1]"
1:54:54 Render target memory points PIP5_pos & PIP5_dir not found. 1:54:55 "DEBUG: LootTable: EPOCH_LT_CfgLootTable_Rifle_m16_EPOCH_items DATA: [[""m16_EPOCH"",""weapon""],0.666667,[""m16Red_EPOCH"",""weapon""],0.333333]"
1:54:55 "DEBUG: LootTable: EPOCH_LT_CfgLootTable_Rifle_arifle_Katiba_F_items DATA: [[""arifle_Katiba_GL_F"",""weapon""],0.2,[""arifle_Katiba_C_F"",""weapon""],0.3,[""arifle_Katiba_F"",""weapon""],0.5]"
1:54:56 "DEBUG: Failed to find vehicle class"
1:54:56 "Epoch: Storage SPAWN TIMER 0.102001 slots left: 1500"
1:54:56 "Epoch: Loading static loot"
1:55:04 "Epoch: Server Start Complete: 29.078 seconds"
1:55:04 "DEBUG UNITTEST INIT: _payload count 128"
1:55:04 "DEBUG UNITTEST INIT: _payload_64k count 65536"
1:55:04 "Epoch UnitTest: version Time: 0 : 0.6.0.0 "
1:55:04 "Epoch UnitTest: 000 Time: 0 : [""NA123"",0] "
1:55:04 "Epoch UnitTest: 510 Time: 0 : [2018,08,05,01,55,04] "
1:55:04 "Epoch UnitTest: EPOCH_fnc_server_hiveSET Time: 0 : "
1:55:04 "Epoch UnitTest: EPOCH_fnc_server_hiveSET 64k Time: 0.0019989 : "
1:55:04 "Epoch UnitTest: EPOCH_fnc_server_hiveSETBIT Time: 0 : "
1:55:04 "Epoch UnitTest: EPOCH_fnc_server_hiveGETBIT Time: 0 : [""isOK:"",true] "
1:55:04 "Epoch UnitTest: EPOCH_fnc_server_hiveGETBIT Time: 0.000999451 : [""isOK:"",true] "
1:55:04 "Loading Settings for VIP event..."
1:55:04 "Loading Settings for DynamicDebris event..."
1:55:04 "Epoch UnitTest: EPOCH_fnc_server_hiveSETEX Time: 0.000999451 : "
1:55:04 "Epoch UnitTest: EPOCH_fnc_server_hiveSETEX 64k Time: 0.0019989 : "
1:55:04 "Epoch UnitTest: EPOCH_fnc_server_hiveGET Time: 0 : [""isOK:"",true] "
1:55:04 "Epoch UnitTest: EPOCH_fnc_server_hiveGET 64k Time: 0.00300598 : [""isOK:"",true] "
1:55:04 "Epoch UnitTest: EPOCH_fnc_server_hiveGETRANGE Time: 0 : [""isOK:"",true] "
1:55:04 "Epoch UnitTest: EPOCH_fnc_server_hiveGETRANGE 64k Time: 0.00299835 : [""isOK:"",true] "
1:55:04 "Epoch UnitTest: EPOCH_fnc_server_hiveEXPIRE Time: 0.000999451 : "
1:55:04 "Epoch UnitTest: EPOCH_fnc_server_hiveGETTTL Time: 0 : [""isOK:"",true] "
1:55:04 "Epoch UnitTest: EPOCH_fnc_server_hiveGETTTL 64k Time: 0.0019989 : [""isOK:"",true] "
1:55:04 "Epoch UnitTest: EPOCH_fnc_server_hiveDEL TEST_DATA Time: 0.000999451 : [1,""1""] "
1:55:04 "Epoch UnitTest: EPOCH_fnc_server_hiveDEL TEST_DATA_64 Time: 0 : [1,""1""] "
1:55:04 "Epoch UnitTest: EPOCH_fnc_server_hiveDEL TEST_EXPIRES_DATA Time: 0 : [1,""1""] "
1:55:04 "Epoch UnitTest: EPOCH_fnc_server_hiveDEL TEST_EXPIRES_DATA_64 Time: 0 : [1,""1""] "
1:55:04 "Epoch UnitTest: EPOCH_fnc_server_hiveLog Time: 0 : "
1:55:04 "Epoch UnitTest: EPOCH_fnc_server_hiveLog 64k Time: 0.0019989 : "
1:55:04 "Epoch UnitTest: EPOCH_fnc_server_hiveMD5 Time: 0.0019989 : [""isOK:"",true] "
1:55:05 "DEBUG: server event ChangeWeather"
1:55:05 "DEBUG: server event \epoch_server_debris_event\EpochEvents\DynamicDebris.sqf"
1:55:05 "Epoch: Weather Change - fog: [0.0127306,0.00104086,0.000569416] rain: 0.896297 overcast: 0.873877 wind: [287.007,5.45274] wind-xy: [1.39375,-4.55663] forced: false"
1:55:05 "DEBUG: Generating new Debris Locations... this is only done once every 7 days." 1:55:06 "DEBUG: Generating new Debris Locations... with seed 969097." 1:55:06 "DEBUG: server event removed \epoch_server_debris_event\EpochEvents\DynamicDebris.sqf"
2:00:06 "DEBUG: server event PlantSpawner"
2:05:07 "DEBUG: server event PlantSpawner"
2:10:06 "DEBUG: server event ChangeWeather"
2:10:06 "DEBUG: server event MoneyDrop"
2:10:06 "DEBUG: server event \epoch_server_vip_event\EpochEvents\event1.sqf"
2:10:06 "Epoch: Weather Change - fog: [0.000992214,0.000210921,6.28679e-005] rain: 0.655488 overcast: 0.519744 wind: [28.9497,2.32238] wind-xy: [1.05622,0.58426] forced: false"
2:10:07 "DEBUG: server event PlantSpawner"
2:15:06 "DEBUG: server event ContainerSpawner"
2:15:07 "DEBUG: server event PlantSpawner"
Any help would be greatly appreciated as i've searched for hours now and cant find a way to get this to work. It would seem there are problems with the @epoch files in your servers directory. You can see from your screen shot that server and client keys are different. 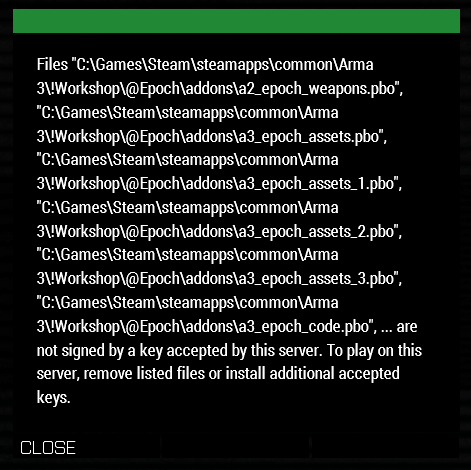 Copy your @Epoch folder to your "EpochServer"
By copying the client files from your Arma 3 game folder, you ensure that, at least, your server and client files are both using the same files. I did copy the client files to the server, And reinstall client epoch, and the epoch server files just nothing seems to work against this. Have you also put the keys on the Server into the keys folder? didn't need to put any keys in it. I wonder what defines the need or not to have keys in there?